Kenneth Branagh's continuing Shakespeare project marches on�it seems unlikely that he'll actually film all of the plays (Cymbeline, anyone? ), and while this is an extraordinarily well-spoken rendition of one of the great comedies, you can sort of feel the director getting a little bored with that exclusively, and giving over to broader conceptual schemes. 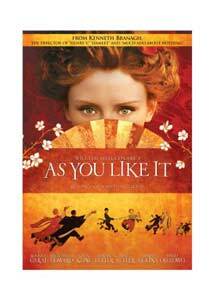 The conceit of this incarnation of As You Like It is that the action is set in late 19th-century Japan�it becomes an investigation of Victorian Orientalism, on some level, and an opportunity to meditate on cultural differences, the kind of thing that Shakespeare addresses more explicitly in plays like Othello and The Merchant of Venice. But it also consigns Branagh's production to a kind of drollery, making it more Mikado than Elizabethan revelry�as rendered here it's a comedy of wry smiles and knowing glances, and not of many belly laughs. But it really is quite lovely, and the actors generally are excellent�Branagh is especially attuned to the politics of the play, making it a piece almost as much about sibling rivalry as about true love. Bryce Dallas Howard is front and center as Rosalind, the daughter of a deposed Duke (Brian Blessed), smitten with the dashing Orlando (David Oyewolo)�she passes herself off as a boy, called Ganymede, when she encounters her true love, and volunteers to be his tutor in courtship (as with many Shakespearean heroines, Howard doesn't really make for a very convincing boy, and you can't help but wonder what it was like when the play was first produced, with a boy playing a girl playing a boy). We get a panoply of lovers, most notably Alfred Molina as a Chaplinesque fool, Touchstone, who is taken with Audrey (Janet McTeer), a bit coarse and perhaps a bit loose; but it's almost like Branagh is happy to let the lovers keep to themselves, and his interest is elsewhere. Much of that is with Jacques, the cultivator of melancholy who delivers the play's most famous aria, beginning "All the world's a stage"�Kevin Kline plays the role, and it's lovely to see him moving gracefully into this sort of work. (He does in fact seem better suited to this than to his recent King Lear, on stage in New York; you've also got to wonder if the director considered playing this part himself.) But at times Branagh seems a bit undone by his production scheme�he does get to use fantastically flowing kimonos and Japanese prints, tatami mats and Sumo wrestlers, but it feels a little hokey and forced, such as when the film opens with a forced bit of haiku. As with so many Shakespearean comedies, this one moves from the urban to the pastoral, but there's something lost, I think, when the magical Forest of Arden becomes a Zen garden. But the verse is delivered with uniform clarity�the play is cut significantly, but those new to Shakespeare may actually want to start with something like this, as it helps to have fine actors make good sense of the occasionally arcane and convoluted language for the uninitiated. Branagh also gets a little too fond of his Steadicam, and the abundance of dollying shots can actually be a little nauseous; still, in the end, of course, all's well that ends well, and this is Shakespeare that's actually entertaining, and not didactic. Image Transfer Review: Very respectable transfer�as you can tell from the cover of the DVD case, Branagh is a little in love with the reds and oranges in his palette, and they generally look lustrous here. All the dollying may have you reaching for the Maalox, though. Audio Transfer Review: All very clean and well spoken, though a little too much soundtrack music occasionally compromises the 5.1 track. Extras Review: The only extra is the brief From Page to Screen (4m:42s), produced for HBO and featuring on-set interviews with Branagh and principal cast members, and many shots of the Steadicam at work. Maybe a little too high concept in terms of its production design, and the camera can move too much and fussily, but a generally very nice production of one of the great plays in the canon.